Can In Utero Exposures Increase the Risk of Disease Later In Life? In the early 1990’s, David Barker and his colleagues studied the relationship between mortality from coronary heart disease (CHD) before 65 years of age and weight at birth in men and women in Hertfordshire, England. They found an inverse correlation between the incidence of CHD mortality and birth weight – the lower the weight at birth, the higher the risk of CHD mortality in adulthood. This was not simply a problem of low birth weight or premature birth, as the inverse relationship was evident among full-term births within a normal birth weight range (i.e., ~5-10 pounds). Subsequent studies by this group and others expanded the range of adult disease inversely correlated with birth weight to include hypertension, diabetes, and obesity. These are components of the metabolic syndrome, and all contribute to increased risk of CHD. Studies around the world have since corroborated and further expanded these findings. The Barker hypothesis states that organs and metabolic pathways undergo programming during embryonic and fetal life in response to the developmental environment that determines the set points of physiological and metabolic processes that carry into adulthood. A corollary hypothesis, the thrifty phenotype hypothesis by Hales and Barker focuses on maternal/fetal nutrition as a determinant of the inverse relationship between birth weight and risk of adult disease. This hypothesis states that during the prenatal (and perhaps early postnatal) period, the developing child adapts to a low nutrient environment by permanently altering metabolism to become more efficient at storing scarce nutrients, an advantage in the face of a life of low nutrient availability. This “predictive adaptive” response would indeed be advantageous if the undernutrition experienced during development continues throughout life. But what if this developmental prediction of the adult world is wrong? What if developmental undernutrition is followed by a later environment of adequate or excess nutrition? The ability to efficiently store nutrients is now a maladaptation, one that will favor accumulation of excess energy stores, increasing the risk of obesity, insulin resistance, hyperinsulinemia, and hypertension. Such a mismatch (Figure 1) between the developmental environment and the environment in later life may be a key factor in increasing the risk of developing the metabolic syndrome. At present it is not clear what, if any, role the developmental environment has played in the rampant increase in the incidence of childhood obesity and Type 2 diabetes in developed countries in the past few decades. Figure 1. The mismatch hypothesis. 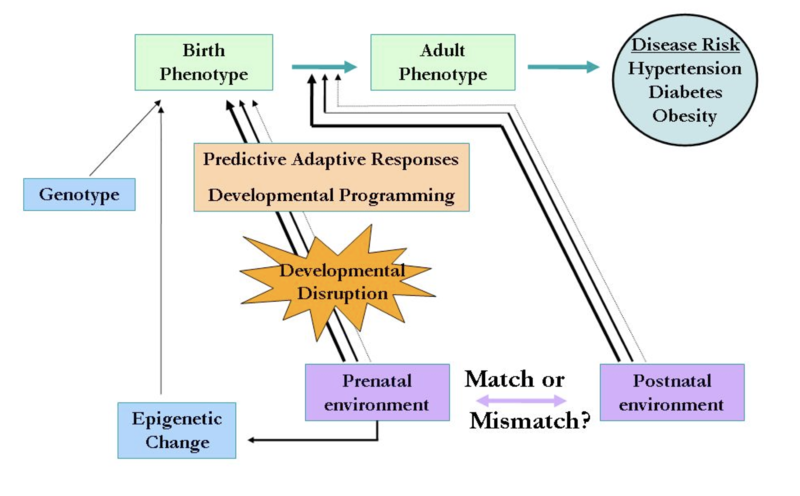 Predictive adaptive responses to the prenatal environment (developmental programming) produce a birth phenotype adapted to a similar postnatal environment (e.g., nutrient deprived). Developmental programming probably occurs in part by epigenetic alterations to the DNA. If the postnatal environment does not match the prenatal environment, the individual is maladapted and may be at increased risk of diseases later in childhood or adulthood. Adapted from Gluckman and Hanson, 2008. Studies in laboratory species, including rats, mice and sheep, have recapitulated the findings in human epidemiology studies. Pregnant rats, either underfed or fed a low-protein diet during pregnancy, have offspring that are more prone to obesity, hyperinsulinemia, and elevated blood pressure than are offspring of rats fed a nutritionally complete diet. Offspring of rats fed deficient diets are born smaller but tend to catch up by weaning and then are more likely to become obese, hyperinsulinemic, and hypertensive, especially if fed a high-fat diet after weaning. Likewise, offspring of pregnant ewes fed a low protein diet demonstrate insulin resistance and elevated blood pressure. Vascular reactivity is elevated, and the number of nephrons in the kidneys is reduced in these offspring; both conditions contribute to development of hypertension. The periods of development most sensitive to the long-term effects of undernutrition have not yet been well-defined in humans or experimental animals. There is mounting evidence that chemical exposure during development may have some of the same long-term effects on health as undernutrition. Very similar to maternal undernutrition during pregnancy, maternal smoking is associated with lower birth weight followed by increased risk of obesity and type 2 diabetes in adolescence. Chemicals, including certain phthalates, bisphenol A, organotins, and diethylstilbestrol, have been called environmental obesogens because developmental exposures to these chemicals can induce obesity in rodent offspring later in life. These chemicals may alter energy balance through their ability to interfere with fatty acid metabolism and/or nuclear receptor signaling in adipocytes and other cells. In our labs, we have shown that diverse chemical exposures during pregnancy in rats can lead to elevated blood pressure in offspring. What are the mechanisms by which developmental undernutrition, toxicant exposure, or other adverse developmental conditions permanently affect health? Alterations of the hypothalamic-pituitary-adrenal axis may be a common mechanism underlying fetal programming. Plasma cortisol levels in adulthood are inversely correlated with birth weight and risk of developing the metabolic syndrome. Levels of glucocorticoids in the fetus can be elevated by undernutrition and other maternal stressors. These changes of hormone levels are paralleled by altered expression of glucocorticoid receptors and affect expression of enzymes, ion channels, and transporters regulated by glucocorticoids. Thus, these endocrine changes may be both the cause and the consequence of intrauterine programming. The molecular basis for developmental programming is likely to be, at least in part, epigenetic modification of chromatin (cross-reference to Greene and Pisano). Epigenetic changes are those that alter the expression of genes without altering the genetic sequence of the genes. Two prominent forms of epigenetic changes are DNA methylation and histone modifications. For example, extensive methylation of cytosine nucleotides in gene promotors tends to turn genes off, which can be permanent. Conversely, acetylation of histones (proteins associated with the DNA) can open the structure of the chromatin and enhance gene expression. There are periods during gametogenesis and embryonic development during which the DNA methylation pattern of the genome is largely erased and reestablished, and there are probably other developmental periods during which particular genes important for regulating growth and metabolism may be epigenetically altered. Maternal smoking is again illustrative, as specific changes in DNA methylation are observed in cord blood and other tissues of newborns of smoking mothers. Insights into the etiology of smoking-related adverse birth outcomes are emerging rapidly. Gluckman P, Hanson MA (2008) Mismatch: Why Our World No Longer Fits Our Bodies. Oxford University Press. 272pp. Hales CN, Barker DJ (2001) The thrifty phenotype hypothesis. Br. Med. Bull. 60:5-20. Janesick AS, Blumberg B (2016) Obesogens: an emerging threat to public health. Am J Obstet Gynecol. 23:1127-1134. Pike KC, Hanson MA, Godfrey KM (2008) Developmental mismatch: consequences for later cardiorespiratory health. BJOG 115:149-157. Reik W (2007) Stability and flexibility of epigenetic gene regulation in mammalian development. Nature 447:425-432. Rogers JM (2008) Tobacco and Pregnancy. Birth Defects Res C Embryo Today 84:1-15. Rogers JM, Ellis-Hutchings RG, Grey BE, Zucker RM, Norwood J Jr, Grace CE, Gordon CJ, Lau C (2014) Elevated blood pressure in offspring of rats exposed to diverse chemicals during pregnancy. Toxicol Sci.37:436-446. Rotroff DM, Joubert BR, Marvel SW, Håberg SE, Wu MC, Nilsen RM, Ueland PM, Nystad W, London SJ, Motsinger-Reif A (2016) BMC Epigenomics 17:976.